Don`t promise me forever, just love me day by day. Alexander Igorevich Rybak (Belarusian: Аляксандр Ігаравіч Рыбак, Russian: Александр Игоревич Рыбак; born 13 May 1986 in Minsk, Soviet Union) is a Norwegian singer-composer, violinist, pianist, writer, and actor of Belarusian descent. 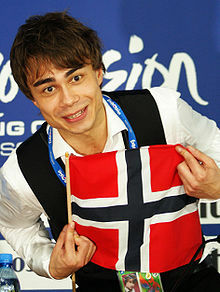 Representing Norway in the 2009 Eurovision Song Contest in Moscow, Russia, Rybak won the contest with 387 points — the highest tally any country has achieved in the history of Eurovision — with "Fairytale", a song he wrote and composed. I'm in love with a fairytale, even though it hurts. 'Cause I don`t care if I lose my mind; Im already cursed. Every day we started fighting. Every night we fell in love. No one else could make me sadder. But no one else could lift me high above. People call me stupid for treating you like a queen, but I dont even worry `cause you`re my unforeseen. And I hope that you`ll be with me, if only in my dreams. But here you are next to me and you`re glad, or so it seems. Your boyfriends might be angry, my girlfriends might be blue. But no one can deny it, from now on I love you. This page was last edited on 5 April 2018, at 21:04.